It’s hard to imagine, but even the seeming vastness of our oceans is under the same threat as the forests. Our oceans are dying. I used to think that ocean acidification was just one more threat to some of the ocean’s critters. I now consider it the most important of a very deadly set of threats! The wiki reports that the extra CO2 we are pumping into the atmosphere also inhibits the growth of some corals and shellfish, again weakening vital ecosystems in our oceans. The impact of deoxygenated and warmer oceans will also hurt ocean ecosystems, with various studies “that simulated the interaction of these stressors and found a catastrophic effect on the marine food web”. Triona McGrath reports that 70% of cold reefs and most tropical reefs, the ecosystem base for a full quarter of the entire ocean’s life, could be gone by 2100! Jeremy Jackson explains the manifold issues of overfishing, acidifying and over-heating the oceans. He starts talking about climate change and warmer oceans about 12 minutes in, but the first part of the talk covers other themes on this page really well. Fishing seems to have peaked as 75% of fisheries are on the verge of collapse. Fishing provides 14-16% of humanity’s animal protein, and over 1 billion people rely on it as their primary source of protein. But we risk permanently damaging fisheries when we over-fish. The wiki explains that the world’s fishing fleets are losing $50 billion each year, and that some fisheries are no longer viable, while some species have already gone extinct. Overfishing can permanently tip ecosystems out of balance. As the new documentary “End of the Line” shows, most of the world’s fisheries are in decline. While there are simple solutions to the massive problem of overfishing, the movie doubts we have the willpower to institute them in time. We are simply harvesting too many fish too fast. For example, Blue fin tuna can grow for 30 or 40 years and weight a ton, but lately their average size has been decreasing. They are now in trouble (wiki). From 1976 to 2006 worldwide stocks of Bluefin Tuna plummeted by 90%. Most seafood sustainability guides recommend consumers choose alternatives to bluefin tuna. According to a 2008 UN report, the world’s fishing fleets are losing $50 billion USD each year through depleted stocks and poor fisheries management. The report, produced jointly by the World Bank and the UN Food and Agriculture Organization (FAO), asserts that half the world’s fishing fleet could be scrapped with no change in catch. In addition, the biomass of global fish stocks have been allowed to run down to the point where it is no longer possible to catch the amount of fish that could be caught. Increased incidence of schistosomiasis in Africa has been linked to declines of fish species that eat the snails carrying the disease-causing parasites. Massive growth of jellyfish populations threaten fish stocks, as they compete with fish for food, eat fish eggs, and poison or swarm fish, and can survive in oxygen depleted environments where fish cannot; they wreak massive havoc on commercial fisheries. Overfishing eliminates a major jellyfish competitor and predator exacerbating the jellyfish population explosion. 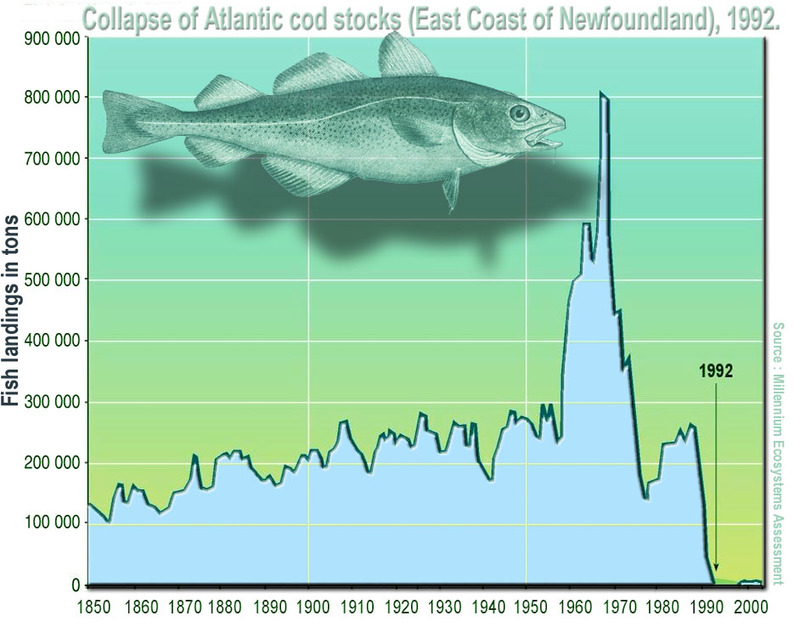 Are the world’s fisheries destined to follow the example of the Atlantic Cod in the 1990’s? (Woah, lookout, there’s another peak). We are also fishing inefficiently. 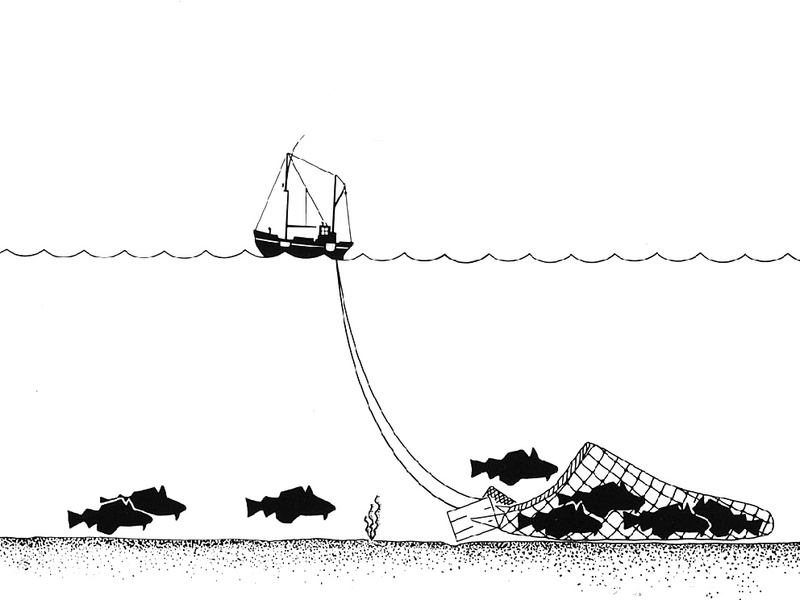 Bottom trawling is a perverse method of fishing that scrapes the sea-floor of all life, only to sell a tiny fraction of the actual catch. The majority is just considered collateral damage. Most of the catch is then thrown back into the sea as ‘by-catch’. It also destroys important sponge ecosystems along the bottom of our oceans. National Geographic photographer Brian Skerry presented some of his work at TED (2010). His work is beautiful, but the subject is not. As Brian’s TED talk so graphically shows, a mere handful of 7 or 8 shrimp kills 10 pounds of ‘by-catch’. 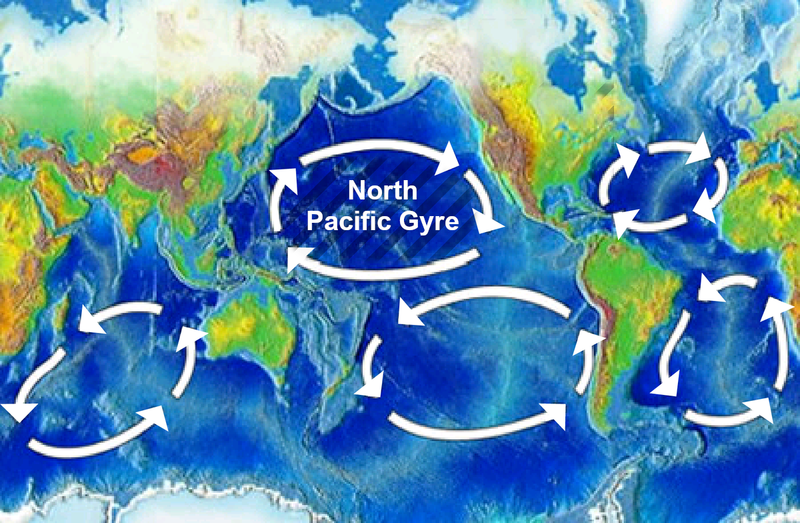 The swirling ocean gyres concentrate this plastic which slowly breaks down in the sunlight, and so our oceans are filling up with microscopic plastic garbage that fish and birds mistake for plankton and food. 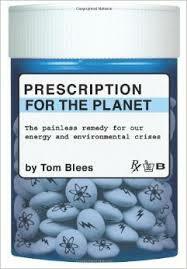 This is also starting to affect the oceanic ecosystem with dire possibilities for food security. The various hormonal and chemical toxins accumulate through the food chain. One day ocean catches could be so toxic that seafood is banned under public health concerns. Some of these long-lasting plastics end up in the stomachs of marine animals, and their young, including sea turtles and the black-footed albatross. Midway Atoll receives substantial amounts of marine debris from the patch. Of the 1.5 million Laysan albatrosses that inhabit Midway, nearly all are likely to have plastic in their digestive system. Approximately one-third of their chicks die, and many of those deaths are due to being fed plastic by their parents. Twenty tons of plastic debris washes up on Midway every year with five tons of that debris being fed to albatross chicks. Besides the particles’ danger to wildlife, on the microscopic level the floating debris can absorb organic pollutantsfrom seawater, including PCBs, DDT, and PAHs. Aside from toxic effects, when ingested, some of these are mistaken by the endocrine system as estradiol, causing hormone disruption in the affected animal. These toxin-containing plastic pieces are also eaten by jellyfish, which are then eaten by fish. The United Nations Ocean Conference estimated that the oceans might contain more weight in plastics than fish by the year 2050.